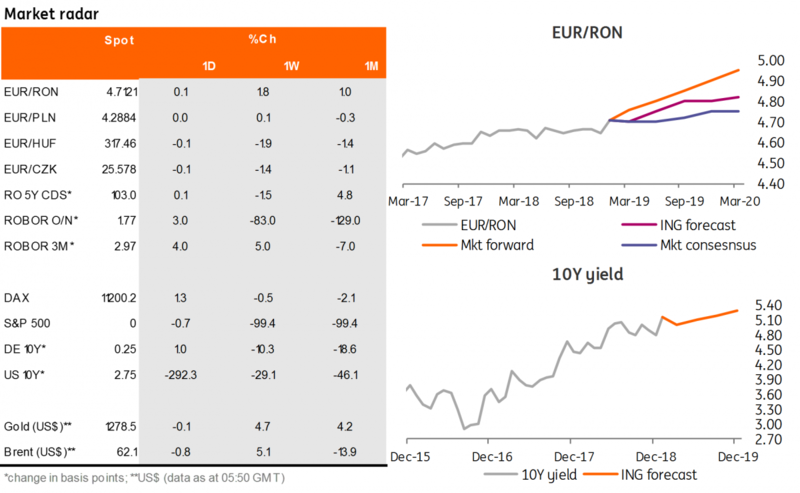 The EUR/RON hit another all-time high yesterday, trading around 4.7150 in large volumes concentrated mainly in the second part of the trading session. The pair closed slightly lower, around 4.7100 as the upward trend seemed to be losing steam a bit. The National Bank of Romania signalled that it won’t let carry rates idle at the deposit facility and organised a deposit-taking auction. The new 5Y benchmark auction was much in line with expectations, in other words, quite weak. For the RON400 million targeted, the Ministry of Finance received total bids of RON241 million. This wasn't so bad given the market context. More surprising was the MinFin’s willingness to pay an average of 4.73% and a maximum of 4.78% for only RON110 million. Post auction the curve shifted 7-8 basis points higher. On the money market, the NBR rolled over its one-week deposit-taking auction, draining RON4.29 billion from 20 banks, quite a bit more than we would have thought. This pushed carry rates above the deposit facility. Everything longer than the current reserve period is trading at or above the Lombard rate of 3.50%. This could look slightly odd given the amount of liquidity we’ve seen deposited at the central bank in the last two auctions. It likely reflects mainly the heightened uncertainties regarding the amount of the budget payments due on 25 January, but FX and fixed income market developments as well.